Jesse Thomas and Lauren Fleshman are a married couple and the co-founders of Picky Bars, a business that makes and sells natural energy bars. Picky Bars was founded in 2010 based on the founders’ mutual interest in athletics and in creating the “perfect” energy bar for athletes like themselves. 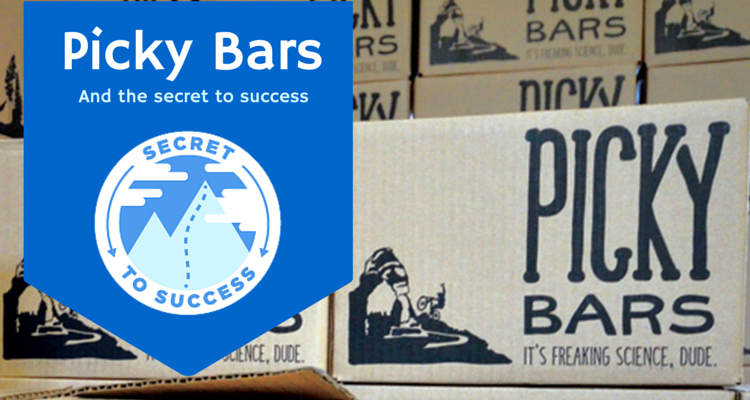 Since introducing the product, Picky Bars has managed to grow successfully. Today, you can buy Picky Bars online and in a number of retail locations across the U.S.
To find out more about how Picky Bars became successful, I sat down to talk with Jesse Thomas about what it’s like to start a business, and to find out a bit about what has led to their success. Jesse had plenty of road-tested advice for entrepreneurs. 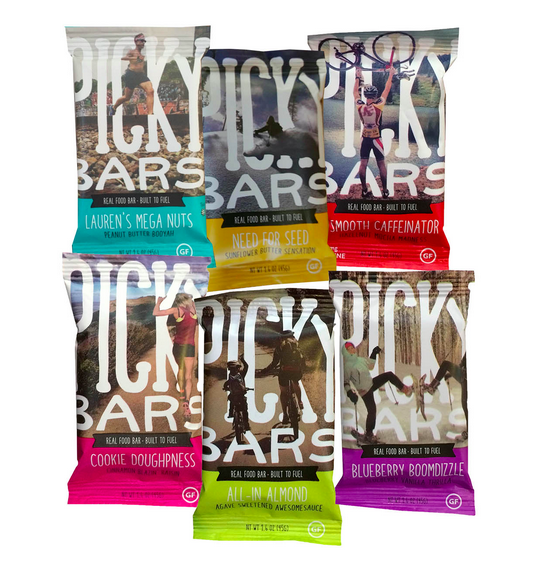 Picky Bars’ 6 Bar Sampler—available for purchase on the website. How did Picky Bars get started? Lauren and I met at Stanford where we were on the track and field and cross country team. We got engaged eventually and moved to Eugene. After doing my MBA at the University of Oregon, I decided I wanted to try to become a professional triathlete. Lauren, who was a professional runner at the time, decided that she wanted to help me by making an energy bar that wouldn’t upset my stomach. I was eating five to six thousand calories a day and I was having all these stomach issues. Lauren [who holds a degree from Stanford in human biology and athletic performance] wanted to make an energy bar that combined all natural ingredients with solid sports nutrition, kind of the best of both natural and performance worlds. What she created with her friend Steph was gluten and dairy free, had a four-to-one carb to protein ratio, all natural ingredients, easily digestible sugars and proteins and tasted really good! We called it a Picky Bar. That was how we started. That was in 2011, late 2010. It was definitely a mom and pop shop operation, just making the bars out of our kitchen for the first year and a half. I put up a website and we started selling them direct to consumers online. Our first employees were actually University of Oregon students that came in and made the bars in our house. For a year and a half, at the peak, before we contracted the manufacturing out, I had ten students who would come in five at a time, over the course of forty hours a week and make our energy bars in our house. It was an absolute circus! I’ll look back on it and be like, “That was really fun,” but it was pretty crazy when it was all happening. A super unique aspect of the business was that we didn’t raise any money to get started. 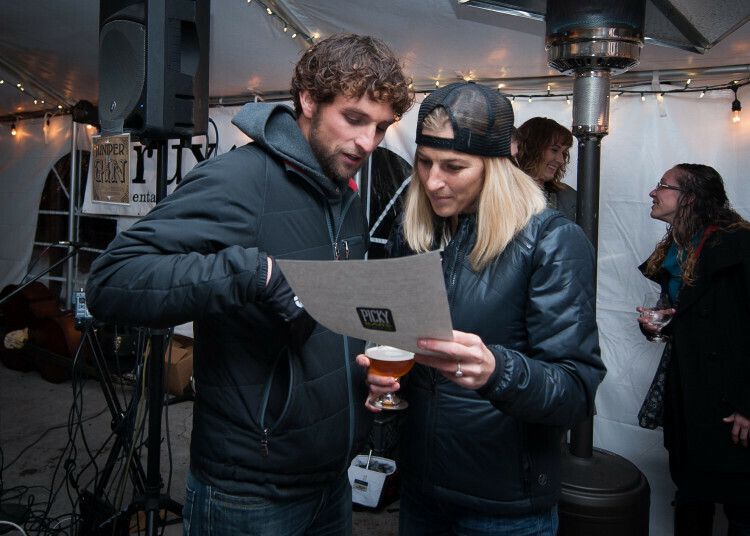 We just started marketing the bars through ourselves, as professional athletes. We wore wristbands or a logo on our jersey, or we tweeted about it and wrote about it on Facebook. It was at the same time that social media was gaining steam and that enabled us to have free marketing to the people who followed us as athletes. That really enabled Picky Bars to grow. Then within about six or eight months we developed our subscription service called the “Picky Club,” which enabled our growth from a financial and operational standpoint because people would sign up for auto-delivery of the bars at thirty, forty, or fifty bucks a month. We had a much more sustainable, easy to project cash flow and received payment before sending the product out to people, which is backwards for most food companies and for most companies that have a retail presence. Why did you choose a subscription-based model for your business? The reason we thought of the subscription model was that we basically had both an opportunity and a problem. The opportunity was this: Lauren and I have a national, even an international audience through our respective sports of running and triathlon through social media and PR and media in the sport. But, we didn’t have national distribution [of Picky Bars], so we were asking people to come back to our website to buy the bars straight from us, which they didn’t mind doing, but the biggest barrier was people just remembering to come to a website to order the product. I was like, “I wonder if we can set up a subscription thing through PayPal.” I looked into it and that’s what we did. The Picky Club has since been much more successful than I originally anticipated. I thought we would get a hundred people over the course of the year. I think we had eighty within the first month. We did about $1.1 million in total sales last year, and over forty percent of our total business was just our subscription service. How did you create your online store? Did you have experience with web design? Initially, it was me just googling stuff. I had learned a little bit about WordPress toward the end of my MBA. I had started a blog for Lauren as an athlete, and for me as an athlete. Then I found out that you could do shopping cart plugins in WordPress. I basically looked on Google and WordPress to figure out how to get this thing up and going. That’s how we did it. I did all the design for it as well, which was remarkably terrible. I am not a designer by any means so we had some terrible packaging designs and terrible website designs, but the content and the copy was funny because I could do that, and it was just an extension of our personalities. Eventually I hired my cousin who was a super talented young graphic designer out of Cal Poly. He came in and designed our packaging and did a massive design facelift on our website. That was how the original brand was born. 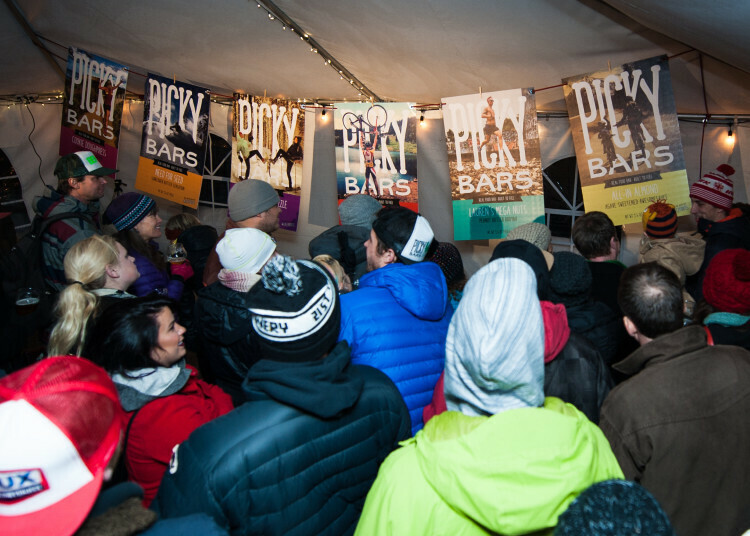 A crowd checks out the newly unveiled packaging for Picky Bars. How important are metrics to your business? Are you tracking things on a regular basis? Yes, we definitely do that. We have a number of different things, and each of my employees is responsible for one to three key metrics that they report on weekly basis. That could be anywhere from new retail sales accounts, to new Picky Club members, to our Picky Club retention rate, to the number of tasks, or the number of deadlines that we hit or missed. I try to give each person a couple or few metrics that really matter to the business and that we can sustainably report on, and then each week at my staff meeting they report those numbers to me as part of their update on the stuff that they’re doing. On a monthly basis, we report our financials and look at our key numbers. The key things we’re interested in right now are our gross margin and, of course, overall sales and overall profitability. For the first time in the company’s history we’ve made some big investments in people and we’re operating for the short term at a loss. As a business owner, doing that for the first time is pretty scary. I’m super keen to see those numbers each month and hopefully I see the loss getting smaller and smaller and then eventually goes away, and then eventually we become profitable! I have always known that monitoring metrics was important. But for the most part, at least monthly stuff, it’s always looking backward. So to me, it’s important to find those most up to date, weekly metrics that can give us a snapshot of the health of our company. Then, when you see that stuff trending over two, four, or six weeks, you might actually catch a problem if there’s one arising. When did you know it was the right time to grow your business? I felt us reaching a peak of what we could accomplish with our current staff in the middle of last year. We just didn’t have the human power to do a number of important things for our business. I said, “Hey, we’ve got all these retail channels or opportunities, we need somebody on retail sales.” We need somebody dedicated to marketing and all of our online based marketing stuff. We need somebody on the operations supply chain side we need somebody dedicated one hundred percent to social media, because between our three or four main social media accounts, it’s a full-time job. It’s a massive piece of our marketing mix. We had a bank loan that enabled us to do that, even though it was going to be spending a little bit more than we were bringing in for the first time in the company’s history. Hopefully it all rights itself. So you essentially made a growth plan? Exactly, we thought “What is it going to take for us to reach the next level?” or “What are the main places where we can really use somebody dedicated?” and that’s what we did. In order to sustain that long term our sales have to grow, but the idea is, with these people in place they will grow. Both our sales will grow and we’ll become more profitable because we’ll have people focusing on making us leaner. Did you always see yourself owning a business or running a business? I have been interested in entrepreneurship since I first understood what business was, which was pretty late in my life. I was pretty focused on being a good athlete for the majority of my life through high school. I wasn’t focused too much on business until I got into mechanical engineering at Stanford, where I started developing products and researching markets where people might buy these products, and getting interested in all of that type of stuff. I found out that during that time that both of my grandfathers were entrepreneurs and I got more interested in the businesses that they had run, the success that they had had. I always thought I would be in tech or sports equipment or something like that. But Picky Bars just happened and it’s been super fun. My dad who is a dentist is an entrepreneur, he owned his own practice. My mom as well, who’s been a very successful businesswoman in a number of different industries and roles. She’s been part of it as well. One grandpa on my mom’s side was a successful entrepreneur who started a women’s clothing company back in the ’30s and ’40s called Miss Pat’s down in LA. That’s cool. That’s part of who I guide myself on. Jesse and Lauren, owners of Picky Bars, at a launch party for their repackaging. I think just balancing all this with my family. That’s been the hardest thing, particularly because Lauren and I started this company together, so being co-founders and co-managers [as well as married]. Technically, I’m the CEO but every big decision goes through both of us and we don’t always see eye to eye. In fact, the majority of the time we don’t! And that’s been really hard. It is possible, as Lauren and I have done it, but it requires a lot of communication and a lot of mutual respect. The ability to put on our business hat and then take it off when we aren’t in the business environment and be just us; that’s something that we are always working on. I love it. It’s not for everyone. It’s much more stressful than a normal job, particularly when you start to put your own finances on the line. I’ve felt a new weight of stress since we signed that bank loan because ultimately for most small businesses your loan is backed by you personally, so that’s scary. You make bigger and bigger investments in the company, and in yourself, and you have to really hope that it’s going to turn out alright. That’s hard, but I love the day to day aspect of it, managing my own destiny, being able to build my own team, and the relationships that I have with those people. Ultimately feeling like I’ve made a real impact and I’ve created something that made an impact on people. What’s in the Picky Bars toolkit? WordPress. The Picky Bars website is on a WordPress platform, and it’s always worked well for them. Currently, about a quarter of all websites use WordPress. Stripe. Jesse admits that with payment platforms, it was a bit of trial and error. “I started using PayPal for the subscription thing and it totally blew up in my face,” he says. “It wasn’t nearly as flexible as we wanted it to be.” Now, he says they’ve found a good fit using Stripe, which is especially helpful for subscription-based payments. “Start With Why” by Simon Sinek, about leadership styles and inspiring people with your ideas, was a big influence on Thomas. The book “precipitated some of the big branding changes that we did with Picky Bars,” he says. “Traction: Get a Grip on Your Business” by Gino Wickman is another influential title for Picky Bars. Jesse says it’s what inspired him to assign metrics to each of his employees to track. “The E-Myth Revisited” by Michael E. Gerber This book is an overview of dos and don’ts in starting a business. Jesse read it in the early days of Picky Bars, and suggests it to other entrepreneurs just starting out. Whats the secret to your success? The two things that popped into my head were: one, knowing that you don’t know everything and so seeking advice if and whenever possible from people, asking for help. I would really encourage any entrepreneur to just ask people for help. People are way more willing to give their time and energy than you might think. The other thing I would say is pretty typical, but it’s just to stay at it and it just requires time and work. I guess the corollary to that means that there’s no magic to making it work. What I’ve discovered is it’s not necessarily the smartest plan or an amazing algorithm that somebody put together that made their business successful. It’s literally just trying and retrying and retrying and retrying. I feel like if I ask people for help and I keep getting up every morning and I try to solve the problems the best that I can that day, then ultimately the business will be successful. Those are my two things. Would you like to share your story? Let us know in the comments!